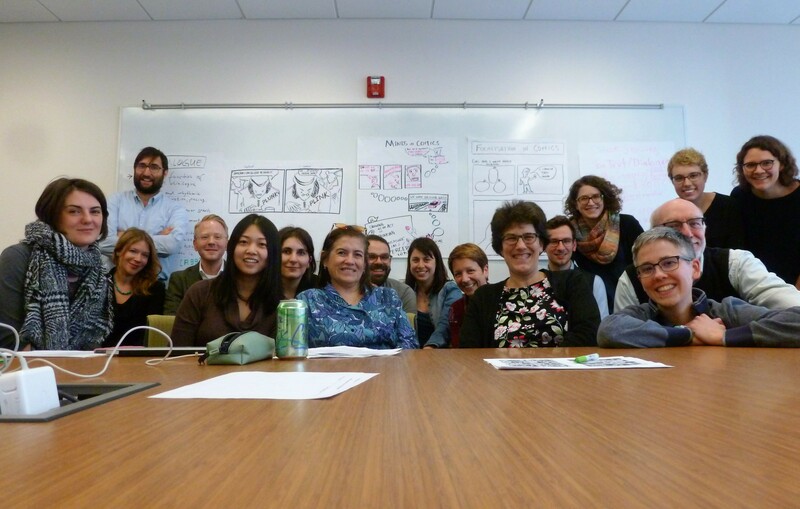 For the initial GNN workshop, we were delighted to have two comics experts from the US and Germany as our featured guests: Kate Polak (Wittenberg University) and Christian Klein (Bergische Universität Wuppertal). 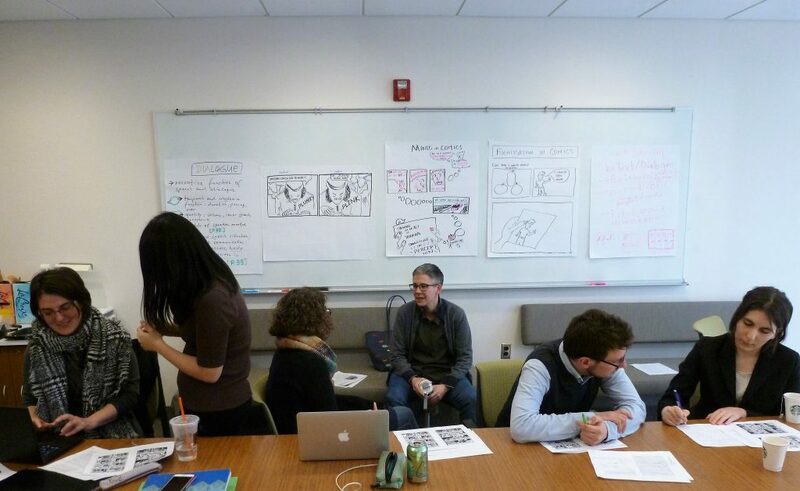 The two-day workshop included critical discussions of participants’ works-in-progress (prompted by pre-circulated position papers) and exemplary graphic narratives from the linguistic and cultural areas in which we work. We also discussed theoretical texts on the subject of representing history and trauma in comics and graphic novels, including Kate’s new book Ethics in the Gutter. Empathy and Historical Fiction in Comics (Ohio State UP, 2017), and worked together to visualize narratological concepts and frameworks as they can be brought to bear on graphic narratives. 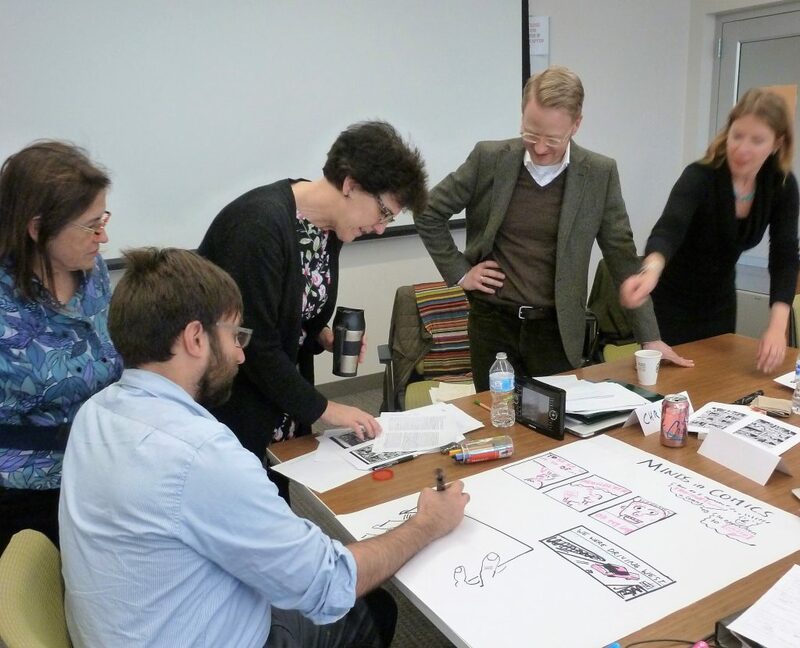 One morning was reserved for hands-on work in MSU’s Comic Art Collection, during which participants examined the works chosen for digitization and discussed possibilities for analysis using digital methods. We also enjoyed perusing the fantastic exhibit Women Comics Professionals curated by Randall Scott. Guests Christian Klein and Kate Polak guide this hands-on session. Our collective effort to visualize narratological concepts. The workshop fostered cross-disciplinary dialogue among faculty and graduate students and helped network members explore materials from MSU’s archives that will serve as the basis for ongoing conversation and research. In future workshops, we will continue to identify new texts for digitization while focusing on different theoretical paradigms within which we can analyze the selected works.